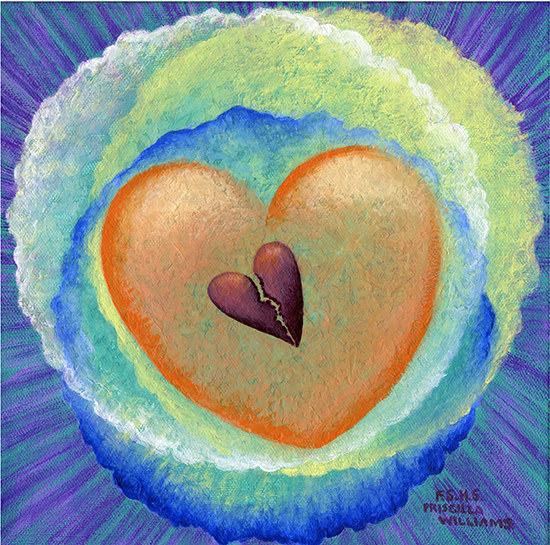 Where must the broken, torn heart go for ultimate healing and liberation? To whom can it turn to feel safe and to be nurtured? Safe Place illustrates the heart of the Omnipotent God cradling our torn and broken hearts. The three outer circles represent our Triune God: The Father, The Son, and The Holy Spirit. Their soft colors and gentle textures illustrate His loving nature, His inclusiveness and His tender embrace. In contrast, the strong diagonal lines behind the circles could suggest His Power and Might over the universe He spoke into being. God’s heart reflects His glory (in orange hues) and is tilted ever so slightly as it extends a loving invitation to rest in Him. His heart’s bright, bold edge gives way to a soft, gentle texture that cushions, protects, and heals the downcast and broken-hearted. 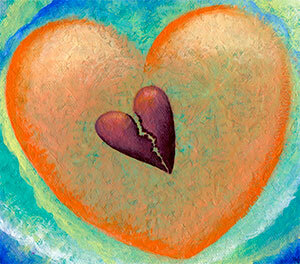 The torn heart, in the center of God’s Heart, is leaning – weak and fragile from all of life’s trials. The thick rough tear suggests intense pain over a long period of time. The loving touch and glory of God, portrayed by the orange glow, are reflected at the top of the broken, leaning heart. 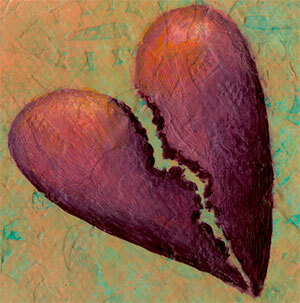 The Heart of our Triune God longs to keep our hearts and to heal them when they break. He heals with His perfect Love, in His perfect way, and in His perfect time. His Love birthed us into existence and will sustain us and lift us above our fears of the future and whatever trials it might hold. We are in the Safe Place when we allow ourselves to receive and be immersed in His Perfect Love.